A number of Apple's cloud services are experiencing an outage, with the iPhone maker acknowledging the existence of issues affecting some users of News, Photos, Find My iPhone, and various key iCloud functions. 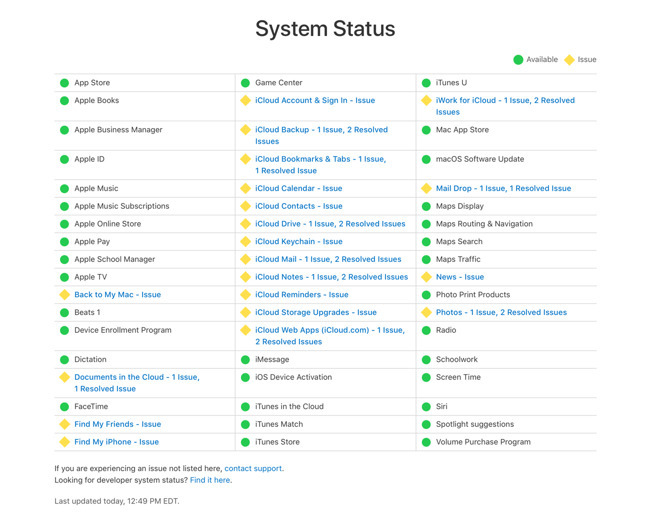 The Apple System Status page shows a variety of areas of the company's online services are not operating at full capacity. According to the logs, the issues all commenced at 8am pacific time (11am eastern), suggesting the problem is likely to be a central issue, not multiple smaller problems that happened to occur at the same time. For those marked as having an issue, most are labeled stating "Some users are affected, users may be unable to access this service." At the time of publication, issues are being experienced for iCloud Account and Sign In, iCloud Backup, iCloud Bookmarks and Tabs, iCloud Calendar, iCloud Contacts, iCloud Drive, iCloud Keychain, iCloud Mail, iCloud Notes, iCloud Reminders, iCloud Storage Upgrades, iCloud Web Apps, and iWork for iCloud. Other non-iCloud items down for some users include Back to My Mac, Documents In The Cloud, Find My Friends, Find My iPhone, Mail Drop, News, and Photos. Update, 4:00 P.M. EDT: Apple reports that all of its services have been fully restored, but has said nothing about the nature of the outage. AppleInsider is continuing to monitor the situation. The day after Facebook had a major outage. What's going on? It's Martians I tell you! And right after the software failed on the Boeing 737 Max. WTF? And right after my hair started falling out... it’s Martian hackers! With the social media blackout yesterday I actually had to talk to my family. They seemed nice. And a another day after some Google services had a short interruption. Seems to me like a nation-state might be involved. I’ve been experiencing daily service interruptions related to my iCloud account every day since we changed to daylight saving time / summer hours. Zero issues for close to a year and suddenly an issue the first time I access my account in the morning every single day. Probably a coincidence but Apple has a long history of DST related bugs. Welcome to reality where technology isn’t perfect, especially when humans are involved. Not so much paranoid as recognizing there seems to be a pattern in the past few days. On their own each of these interruptions wouldn't be considered all that unusual. Three major platforms and each one on three different days in a row is IMO. iCloud is working fine on my iPhone, iPad and Mac. But when you're in the unlucky position you have to log into iCloud Web everyone knows how terrible slow and ugly this monstrosity is. It's time Apple starts upgrading this thing, so it's actually workable and ecstatically appealing again. GSuite actually had a fairly long interruption of about three hours. GSuite Webmail (Gmail) was working but IMAP/POP services were down, as was Google Drive and Hangouts. My question is are these services using the same cloud service backbone, like AWS? Pay attention to the political landscape much?